Tsenden, Bhutan’s national tree, is considered sacred in Bhutanese culture and religion. It is Buddhist belief that Cupressus cashmeriana was first brought to Bhutan by Guru Rinpoche, an 8th century Indian Buddhist master, in the form of his walking stick. Alongside naturally occurring strands, the trees have been widely planted close to Buddhist Dzongs (temples) and monasteries. Many of them have now grown to spectacular heights and are associated with important Buddhist spiritual masters and scholars. Tsenden timber is highly durable and is excellent for making furniture. It is also resistant to rot fungi and borer insects. These qualities and its religious significance have made its timber highly sought after for the construction of Dzongs and monasteries in Bhutan. However, the construction and renovation of Dzongs and other important buildings in Bhutan is putting increasing pressure on wild Cupressus cashmeriana stands and Bhutan’s national tree is now threatened by unsustainable logging rates. Already many of the more accessible trees have been felled, with Tsenden forests only remaining in remote valleys away from settlements and roads. 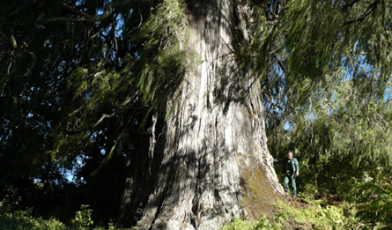 The Global Trees Campaign has launched a project to prevent this iconic and culturally important tree from disappearing. 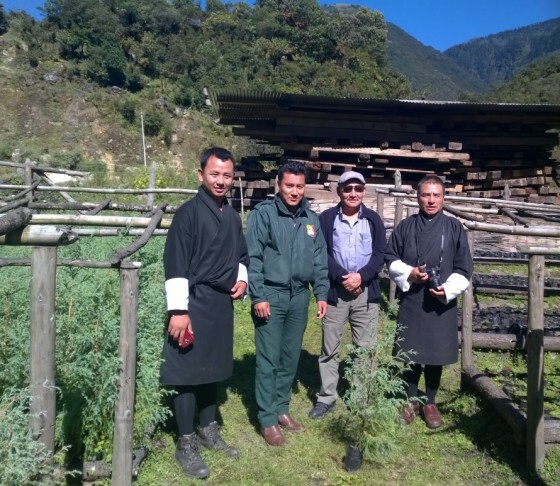 Based in the Dangchu Valley, which houses Bhutan’s largest Tsenden forest, the project aims to propagate trees in plantations to create revenue for local people in future and to provide a sustainable source of Tsenden timber. The project also plans to raise awareness of the importance of native plants such as their national tree and the need for their conservation. Read more about this project here. Miehe, G., Miehe, S. and Gurung, D.B. (1999). Plant formation in central Bhutan and the challenges of conserving biodiversity II: Follow-up survey of natural Tsenden stands, Oct-Nov 1999. Lobesa: Bhutan-German Sustainable RNR-Development Project, Ministry of Agriculture, Royal Government of Bhutan. Wangdi, T., Norbu, N., Dendup, P., Singye, R., Chettri, B.B. and Ghimeray, K.N. (2012). In Search of Sacred Giants: An Assessment of Tsenden Forests in Bhutan. UWICE Press, Bumthang.